Creepy door cover, featuring bloody body silhouette, handprints and smeared word of warning: HELP US! 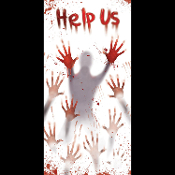 Realistic looking door displays ‘‘HELP-US’’ in bloody red letters, complete with creepy body silhouette, scary bloody spatters, smudges, drips and multiple handprints on a milky white background. Cover measures 30-inch wide x 5 feet tall. Attaches with tape so it can be taken down, folded and reused. Door Cover Pscycho Dexter-theme Serial Killer Design is plastic, so can be wiped clean. Also makes a weird gruesome basement, cellar, garage, bathroom shower, or refrigerator door cover, too . Use to create the scariest and spookiest house on the block! Hang over doorway, window, or mount on ceiling. Great additions to cemetery, graveyard, dungeon, witches den, scientist lab, mad doctor office, pirate scene, etc. Fresh Decor from a Creepy Haunted House!